LA LA LAND Review | Warped Factor - Words in the Key of Geek. Tony’s not feeling the La La Love. La La Land is what happens when you throw three movies into a fighting cage and set the ensuing carnage to uninspired and uninspiring music. One movie emerges at the end, because ‘there can be only one,’ but it’s not really what you’d call intelligible. It’s being feted everywhere and offered 14 Oscar nods, which arguably tells you rather more about our desperation for any kind of distraction and brightness this year than it does about the quality of the movie. Let’s say right from the start that it does look very pretty – some of those Oscar nods might be justified – the costumes, the bold use of colours in a themed way, yes, OK, that might give you a reason to stay till the end. But even so, La La Land is little more than the prettiest car crash you’ll see this season. La La Land starts by trying way too hard to be a love letter to the great MGM musicals, where people broke into song, danced around a bit, and ended the scene going back to ‘normality.’ Now, if you like that sort of thing, and there’s no inherent reason not to, there’s a thing you should do – you should watch some of the great MGM musicals. Not this. The songs are crunched awkwardly into place as though writer Damien Chazelle has just scrawled ‘Insert three minutes of wonderfulness here.’ The songs are also strangely – and we do mean strangely, given the amount of semi-self-conscious dancing that accompanies them – turrrrrgid. Opening number Another Day of Sun for instance manages to irritate within its first minute, and then keeps going for almost another three. On stage, it might work better. On screen, it looks and sounds like an 80s pop video to a 50s musical number. Someone In The Crowd, the movie’s energising ‘Get out and grab your dream’ number has all the right moves and many of the right notes, but is shot and delivered on screen as if by someone who’s been told about the whole musical thing, but doesn’t really see the point of them. The energy it’s supposed to be imparting, the belief, the forced optimism of life and professional parties in La La Land, fails to make it through direction that feels like it’s had a healthy bite from Dracula. It’s anaemic in pace despite being gloriously primary in colour on the screen. Similarly, shots were our two leads discover their attraction by dancing together at an observatory include scenes where it feels like the script direction was ‘Buggered if I know – do something cheesy like they would have in the musicals’ – this sense of trying too hard to manufacture wonderfulness screams off the screen like a coded message – Get Help: We Have No Idea What We’re Doing Here And Haven’t Slept For Days. So much then for the love letter to the great musicals. Surprisingly, it also strives to be a love letter to jazz. Because…reasons. Actually, to be fair, because it has to be about something and it it’s going to be about something, then why the hell not be a love letter to jazz? Stone, as Mia, has some potential, but this is by no means the movie for her. The songs and choreography, as we’ve said, are turgid and lacking the oomph to self-believe, and Stone delivers them at exactly that level of commitment – in other words, she does the job she’s hired to do, but even she can’t give the musical numbers the pizazz they need to work as musical numbers. She goes through the steps and the notes as though she’s swimming through an ocean of nonsense, and gasps in relief when she reaches the other side and gets to do some acting again. Acting, there is, and though Mia as a character is somewhat lazily written – she’s more or less the stereotypical small town girl who fell in love with the movies and tries to make it in La La Land - Stone actually makes Mia something sympathetic, particularly in scenes of various auditions, bringing out the madness of a town that depends on people spilling raw emotion in twenty auditions a day to people who could hardly care less. This is the third movie that La La Land is trying to be – a depressing-as-hell meaningful indy about the unlikelihood of success but the potential of dreams shared. Again, in that guise it has its moments of success, more or less thanks to Stone making you feel them. La La Land has been described as a ‘romantic musical.’ This is pretty much a misnomer on both counts – the musical numbers grind against their inclusion, and there is no romance in the movie. Mia and the 2x4 absolutely do not fall in love, not in any scene. They fall into twee, this-is-what-we-think-the-musicals-did attraction, and then they fall straight into ‘relationship’ as the movie shifts us forward a whole season, so the ‘romance’ happens off-screen or in montage. It’s also very much an indy relationship – shared dreams inspire actions, progress brings bickering and the kind of fight that looks as though it went entirely unscripted: you could give two drama school kids the big fight scene, and they’d come up more or less with what makes it onto the screen in La La Land. There’s some rallying of human emotion before the end, but a great romantic story of the age, this is not. 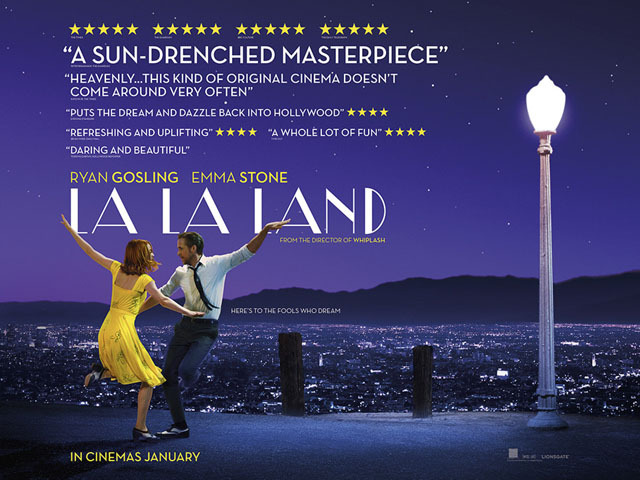 Arguably though, this is La La Land’s genuine raison d’etre coming through – in a story of shallow, forcemeat musical numbers, slightly condescending, mainsplainy lessons from a white guy about the greatness of mostly black jazz legends, and the potential power of two strangers uniting to support each other in their individual dreams, the thread of one of them not letting the other give up on what could be their big break, or could be a spirit-crushing failure, even though their relationship such as it is has hit a patch of maddening indy uncertainty, seems to underline the message that having an ambition, a dream in La La Land is more important than any relationship could ever be. And the ending…the ending does have a cogency, spinning on from that moment of support-no-matter-what, and spinning both the leads’ lives on five years. There’s a way, way overlong Sliding Doors sequence that seems to show a kind of saccharine, everything-changed-by-more-faith-in-and-support-of-each-other alternative version of more or less everything you’ve just sat through, but ultimately it seems that each of the leads achieves what they believe to be their happily ever after, and are generally happy with their destinies, except when they think about what could-have-been. This tedious blend of overworked, underoomphed musical numbers, intense jazz passion and indy misery has been described as all kinds of perfection, and ‘a real cinephile’s movie.’ Never let it be said that a geek with a straight face accused a cinefile of being up themselves, but on the evidence of this movie, it would seem cinefiles delight in underwhelming, manufactured moments of wonderfulness, lectures on artforms, chemistry by-passes and even unconvincing misery. By all means go and see it if you have the curiosity to do so – it could be that we’re just jaded old cynics and La La Land actually is as magical as the highly-paid PR department is telling you it is. Certainly, there’s little doubt it will take home a clutch of those shiny golden fellas. Will it deserve any of them? Yes – for the look of the piece and the costumes, certainly. For any of the performances, the music, the story or the direction. Oh hell to the no.